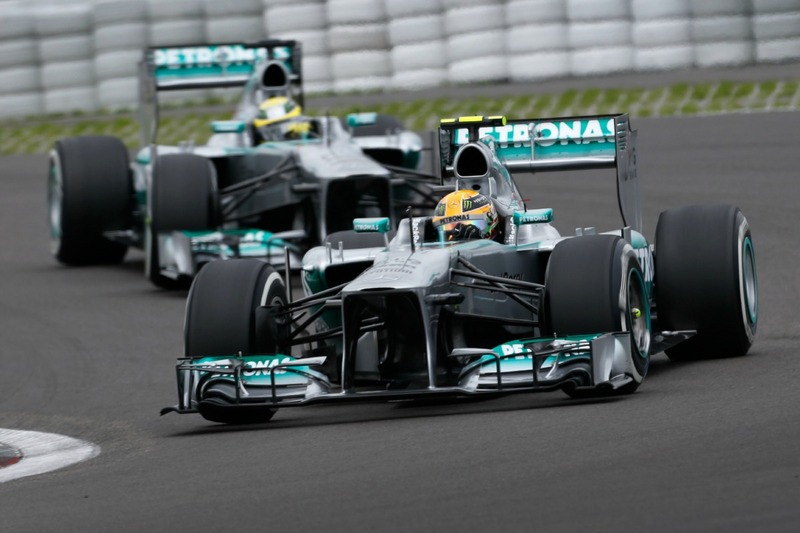 First and second practice for the 2013 German Grand Prix are over, and yielded few surprises. Red Bull and Mercedes are clear favourites for Saturday’s qualifying and Sunday’s race. Behind them are Lotus and Ferrari, neither team quite quick enough to make a strong challenge but strong enough to pick up the pieces if anything goes wrong with the leading two teams. And then there are the midfield teams – McLaren, Force India, Toro Rosso – who will compete for the final points positions. Last, the teams that have been struggling all season – Sauber, Williams, Caterham and Marussia. The days leading up to the German Grand Prix weekend have been full of tyre talk. Pirelli have come under intense fire for the multiple tyre failures that occurred during last weekend’s British Grand Prix. The Grand Prix Drivers’ Association (that represents most, but not all, of the current F1 drivers) got together on Thursday and issued a statement to the effect that the drivers would withdraw from the German Grand Prix if it became apparent that similar tyre failures were present this weekend. But, thankfully, tyre concerns seem unnecessary. Two 90-minute practice sessions on Friday proceeded without even a hint of a tyre problem. In fact, the opposite was true. The tyres lasted well, and produced consistent lap times over long runs. It looks like Pirelli have hit the nail on the head with the changes they made to the rear tyres leading up to this race. Those changes concerned the material used for the belt that runs around the tyre under the tread. The 2013 Pirelli tyres were designed with a steel belt that made the surface of the tyres very stiff and flat. The idea behind the steel belt was to make sure that as much of the tyre surface as possible would be in contact with the track surface, which would make it easier to warm up the rear tyres. But unfortunately, the tyre construction has proven to be problematic, with failures occurring at various races in the early part of the season. And so, after last weekend’s fiasco at the British Grand Prix, the steel belt has been ditched and replaced with a kevlar belt. And so far it seems to be working well. Pirelli have brought their medium and soft compound tyres to the German Grand Prix. Friday practice showed that there is a difference in performance between the compounds of between eight tenths and a second per lap on low fuel. The soft tyre is, as expected, the quicker of the two compounds, but it is also wearing quite a bit faster than the medium compound. That could make for an interesting first half of the race, as there are likely to be markedly different tyre strategies through the field. The top ten drivers on the grid are required to start the race on their qualifying tyres, which means they will almost certainly all be on the soft tyres while running heavy fuel tanks in the early part of the race. Those who qualify 11th to 22nd have a choice of tyres for the start of the race, which gives them the option of running the more durable medium tyres while their cars are heavy with fuel. We could, therefore, see a situation where one of the midfield cars spends some time leading in the middle phase of the race. That would be the result of the front-runners pitting early when their soft tyres wear out, but the midfield runners still having life in their medium tyres. The order should even out by the end of the race, as the difference in performance between the front-runners and the midfield is large enough that tyre strategy will make very little difference to the outcome of the race. Red Bull were on top in the second practice session of the day, but Mercedes are not far behind. The Silver Arrows drivers both complained of understeer after Friday practice, which is something the engineers will work to cure before third practice tomorrow morning. It does suggest that Mercedes have not yet shown their full pace, which is ominous for the rest of the field. The broad conclusions that can be drawn from Friday practice are: 1. Red Bull and Mercedes are likely to fight for pole position and victory; and 2. Tyres are not likely to play a significant part in determining the outcome of the race.